HTC is one of those manufacturers whose customers stay loyal to them across models and devices. Now, that is one incredible feat considering the fact that the market is flooded with top notch models and manufacturers like Apple, Samsung, LG etc. So, HTC must be doing something different from the others than providing high end devices with path breaking technology. If you were to break down the best USP’s of HTC, one would definitely draw out the HTC’s Sense UI as the most favorite pick. The Sense UI has become an instant hit ever since it was released due to its classy and user friendly interface coupled with some cool features. 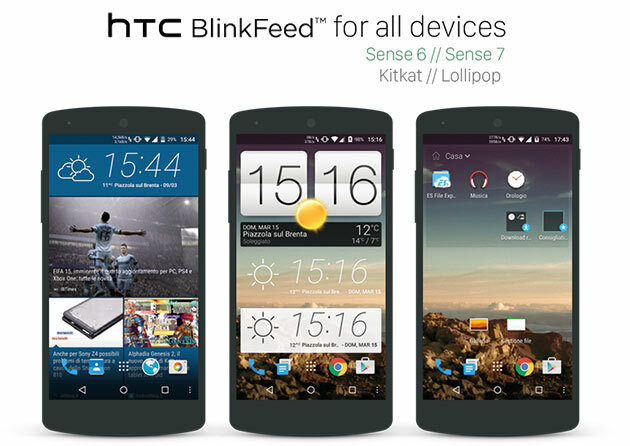 One of the most sought after features of the Sense UI is unmistakably the HTC BlinkFeed Launcher which makes it so much easier for users to access their favorite pages quite easily. As a result of persistent efforts put in by various developers, the BlinkFeed Launcher is now available on other Android devices as well. It can be installed on various versions of Android without having to seek any root permissions. However, your Android device should meet the following requirements before the BlinkFeed Launcher can be installed on it. How to install BlinkFeed Launcher on your Android device? Given below is the step by step procedure to install the BlinkFeed Launcher on your Android device. Once all the four APK files have been successfully downloaded, you can begin with the installation of them, individually. Tap on each of them and follow the on screen instructions to finish the installation process. There is no specific order in which you need to install them. As long as all the four APK files are installed, you are good to go. Most Android users would be savvy to its usage, which is quite easy and user friendly. To add a widget to your home screen, long pres the home button. Similar, apps can be added by dragging them to your home screen. The BlinkFeed screen thus installed can be easily accessed anytime by swiping to the left most panel on your screen. You can make use of the ‘Get the latest news that matters to you’ option to add website to the screen. Then you can add various social media plugins to your home screen. The corresponding plugins of various social media platforms can be downloaded and installed to your Android device. You need to open the downloaded plugins and grant permission for BlinkFeed to access the same. This will add the selected social medial platform on your BlinkFeed screen.